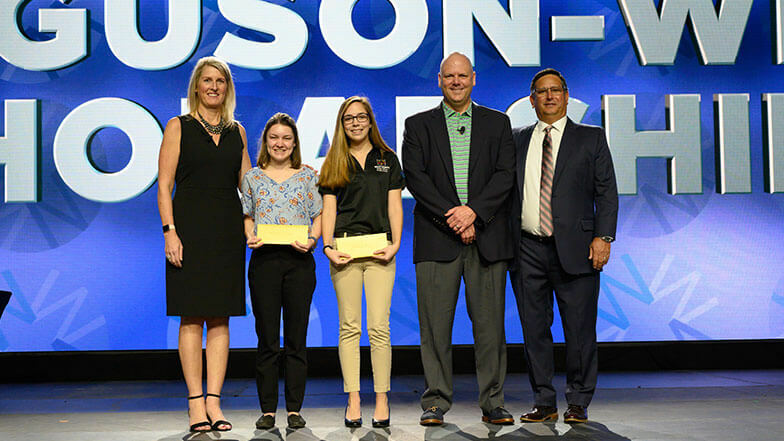 Lindsey Stasi, a sophomore at the Wentworth Institute of Technology, and Madelyn Conway, a junior at Purdue University, received $5,000 Ferguson – Women in the Mechanical Industry Scholarships. For the first time, Ferguson is underwriting these scholarships, which recognize high-achieving female students working towards a degree relative to the mechanical industry. To mark this new partnership, the scholarships were presented by Todd Young, Vice President, Commercial Business at Ferguson and Kori Gormley Huppert, Chair of Women in the Mechanical Industry.